Every day life often compels me to rush, paying little to no attention to the most important things, like friendship, but… every now and then, I love taking a break and stop to invite for dinner friends and families, I have not seen for long and it is this lovely French walnut wood, that thank to its many leaves, allows me to sit up to 18 people, and between starters and main courses, between shining candles and lots of laughing, I can make new friends or, can catch up with old ones. A round table with a central leg, it is a piece of furniture that combines elegance with everyday use. Its having just one leg under the central area, allows each single guest to sit comfortably and provides the table itself with a sense of “lightness”. Its not having any corners makes it possible for the table to be fit also for passageways, leaving enough room around it for people to move freely. This kind of table became very popular in the19th century, especially in France and Italy, in middle class houses, where elegance and friendly use, were the main concerns. While years, better.. while ages passed away, shapes became heavier and heavier, Charles X’s style and Neo-Classic Louis Philippe ‘s style got abandoned and a new Renessaince style was born, enriching tables with its lions paw legs or dragon paw legs, with more intricate inlays and deeper bands. 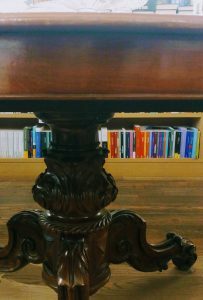 We need to date back to the Roman times to find the first examples of one -legged tables. Their opening mechanism is often simple and built with a different wood, like, oak, for example, since stronger and less subject to wear and tear. The central opening is, but for few more complex exceptions, in slices. To provide the leaves with a strong enough support, the options were various and varied from additional legs, hidden under the central surface, fixed with a deadlatch zip, that held the table stable; to a central leg divided into two legs, that hides a third, smaller leg, that stays in the middle, while the other two extend to the table end, supporting it. When buying a table like this, we must pay very close attention to the fact that table and leg are not “married”, as we say in jargon, i.e. that they have been made at the same time and not assembled later on, originating from two different tables, therefore diminishing the table value and its stability. 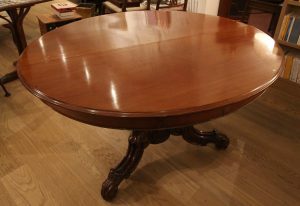 Do not worry if the table top is, especially when not yet restored, of a different colour from its leg, since this is mainly due to the natural wear caused by its exposition to the light. Golden mahogany, this is the wood that makes the table I am talking about in this post, which has an oval shape and opens on its wider side, creating a large and welcoming surface, enabling people to sit down and see each other, face to face, while laying trays, chandeliers, plates without hindering in the way. The band is shallow enough to make sitting down comfortable. The leg is rich in decorations, with its acanto leaves, but light and elegant. A couple of hidden, well shaped legs and its 6 leaves make it possible to extend it for a family dinner. It is perfect for modern houses, especially if you combine it with design, light and simple chairs, that stress the beauty of the table itself.